The comment in this image that photo is “as well composed as the best renaissance art”, is interesting. Firstly – it’s as well composed as the best romantic neoclassical art, some 400 years after the Italian Renaissance (there’s more time between Da Vinci and Gericault, than Gericault and Picasso). But our collective apathy toward our own cultural history is not the most interesting part. The power in this image is not so much in its composition directly, but how much that composition makes the content of the image play in the same intellectual/emotional space as the old paintings it borrows them from. We read the brawl with all the heroic grandeur of neoclassical history painting because we are seeing it through the lens of neoclassical history painting. 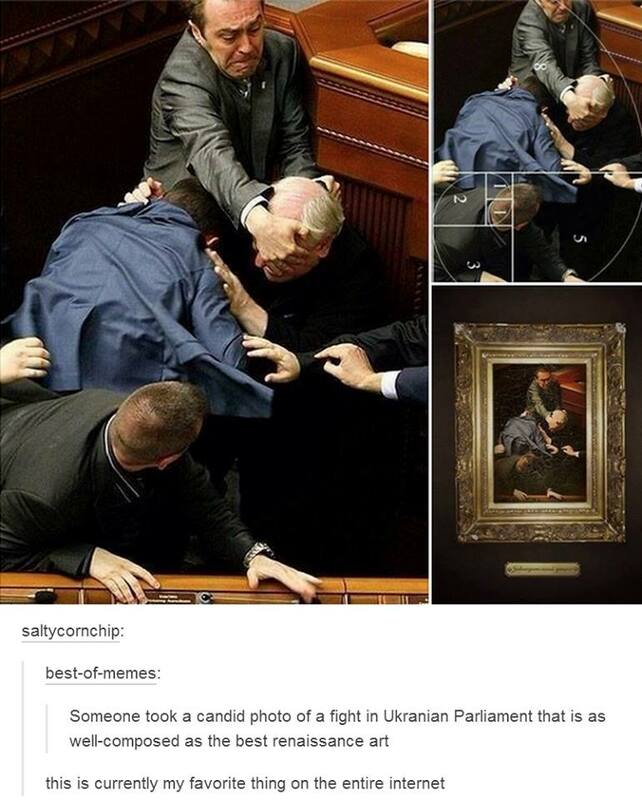 And so the struggle in the Ukrainian Parliament, becomes “The Struggle in the Ukrainian Parliament”, and the picture becomes a grand satire within a cognitive dissonance that exists between a schoolyard fight with old men in suits, and the “really important stuff” we see in “real” Art museums.